My Manu neighbour reckons the final score will be Dan Carter 21 - Manu Samoa 22!! All Blacks pinch the lineout on halfway, but lose the ball forward out wide. It was Dagg this time who fumbled the ball forward. It's all been pretty rusty out there. 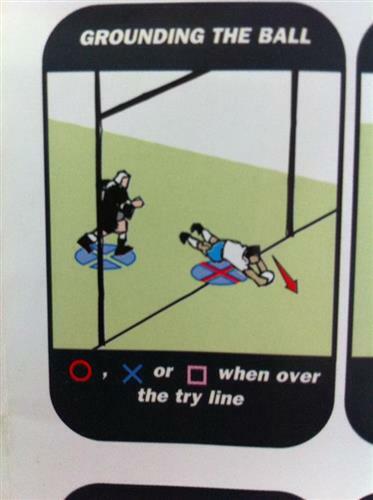 PENALTY TO SAMOA - All Blacks pinged for being offside this time. That brings the penalty count up to 13 for the first half. Less than a minute to go now and Samoa have a lineout 30m out from NZ line. But they have lost the ball and the All Blacks can counter attack. The ball is lost forward though once again from NZ and the ref blows it up for halftime. 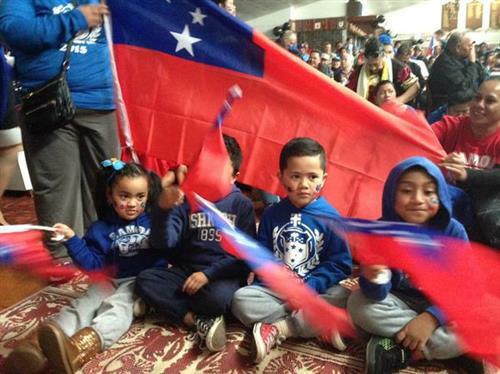 They've waited an awful long time for a glimpse of the All Blacks but even the Apia crowd wouldn't have been too impressed with what they saw in that first half. Four Dan Carter penalties, a lack of fluency with ball in hand and too many errors was the sum total of what the All Blacks produced. The home side weren't any better, squandering rare opportunities in possession with rudimentary mistakes, missing touch from penalties and fumbling simple passes. Last time I was at Apia Pk - covering the BIG 1991 World Cup quarter telecast vs Scotland - the Manu dream kind of lived till halftime too. Well what did we all expect? The good news is that the game is still close, but it isn't going to be as exciting as an AB v SA or AB v Aussie game. The players are now making their way back out onto the field. Go the all blacks.... how about a try next half? When will Steve Hansen go to his bench? There are plenty of quality players there who will be desperate to impress before the World Cup. Oh dear. Carter gets the second half started by kicking the ball out on the full. Hansen will not like that. Tuilagi just received the ball wide left with space and tried to run straight over George Moala but the All Blacks winger did a great job, bundling him into touch. The second half has picked up where the first started, with knock-ons and loose passes. This time it's Samoa who are guilty of losing the ball forward and the All Blacks will have a scrum just inside Samoa's half. Second half cone on all blacks bring it home. 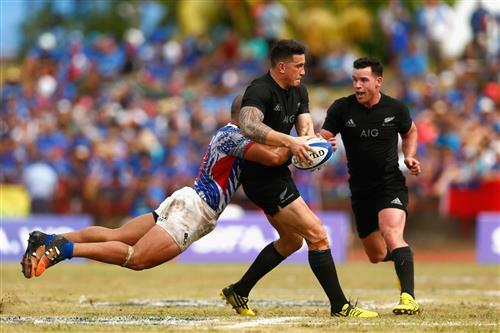 Samoa are throwing their heart and soul into these tackles. The pressure on Andy Ellis has been immense and they are responsible for breaking up any sort of NZ rhythm. George Moala has scored in the corner. It came from a clever Dan Carter kick into the corner, Moala met the ball on the full and steamrolled his way through Tuilagi to get to the line. We saw the All Blacks attempt that early in the first half, with Carter's crossfield kick carrying just too long and over Moala'a head. It was pinpoint on this occasion, but Moala still has plenty of work to do. A great debut try for the Blues man. Big moment for George Moala and just the lift this game needed. Carter adds the extras. 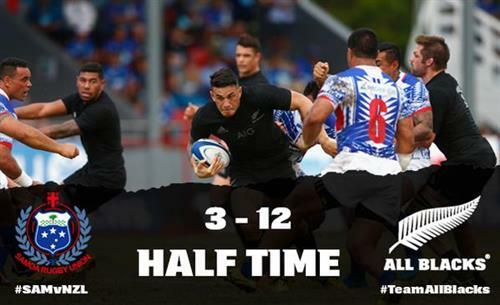 All Blacks lead 19-3. Charles Piutau has spilled a huge high box kick now. If he had caught it, it surely would have been a try. But he fumbled and Samoa have a scrum on halfway. 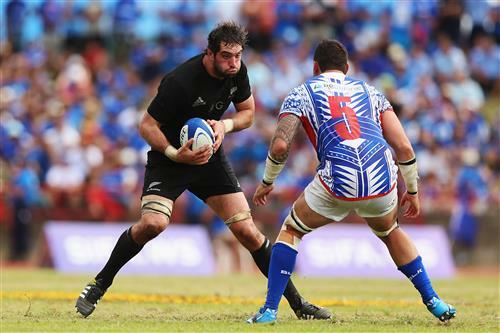 PENALTY - ALL BLACKS OFFSIDE - Samoa will have a shot at goal from right infront. 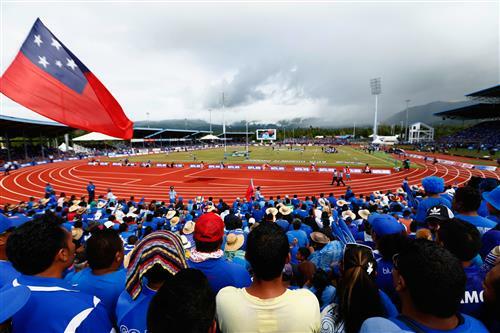 Tusi Pisi slots the kick and Samoa have doubled their points. Samoa are having a good little phase here. Once again they are on attack and once again the All Blacks are penalised for being offside. The penalty is on halfway but Pisi thinks it's within his range so is going to have a crack. Wow. Pisi's kick hit the cross bar and was scooped up by Dab Carter who then send a raking clearance way back on into the Samoan half.